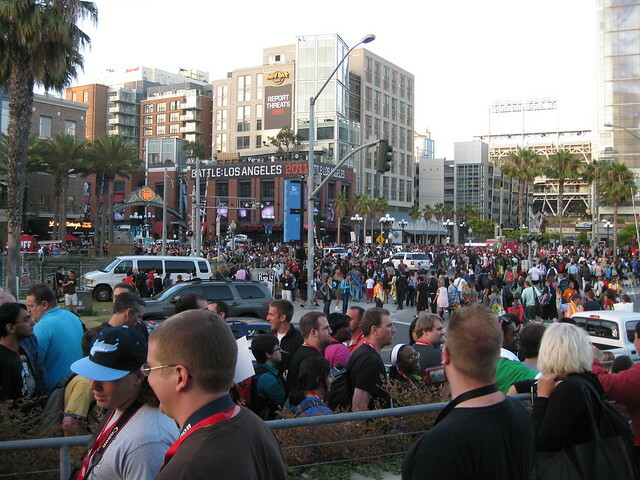 The plaza near the Gaslamp Trolley station, 5th Street and L, bracketed by the Omni, Hard Rock Hotel, and Hilton Gaslamp, has become the main hub of off-site Comic-Con activity over the last few years. It’s the most direct route between the convention center and Downtown San Diego. 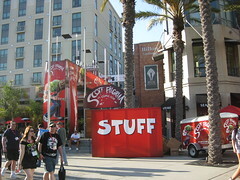 Unlike the crossing at 1st, there’s enough space to set up displays and businesses willing to undergo a SyFy makeover…so they can set up the Green Hornet Car (and the Green Hornet girls), the Cafe Diem, and the Scott Pilgrim Experience (with free garlic bread!). The city has started blocking off the area to cars to make room for pedestrian traffic, but since people still need to cross two trolley lines, a railroad, and a street, the crowds are a captive audience. As a result, the place is packed not just with people attending the con, but also with promoters handing out flyers, postcards, temporary tattoos, comic books and goodie bags. The Beat describes it as the “heart” of the con, or possibly some less savory body part. It’s sort of like walking down the Las Vegas strip, only instead of sketchy-looking men handing you trading cards* with pictures of hot women and phone numbers, there are hot women handing you cards with pictures of spaceships and sketchy-looking men with website addresses. Well, mostly. One promoter shoved a movie postcard and a condom packet into my hand with the URL of what I hope was a viral marketing website slapped onto it. And then there are the people there not to give you stuff, but to be advertising. 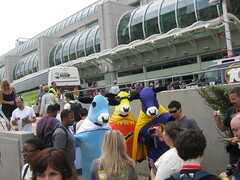 The ones in promotional costumes, like the Fandango paper-bag puppets or the Chik-Fil-A super-hero cows. 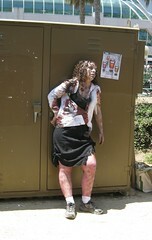 Zombies promoting The Walking Dead. I never could figure out whether the man with the “CIA Is Evil!” sign was serious, or part of the same viral marketing campaign that had a legion of Men in Black handing out “confidential” envelopes to everyone who walked by. »Full index of Comic-Con posts and photos. *Go ahead. Tell me they don’t look like stripper trading cards. Though I remember some webcomic where the cast decided to use them for a collectible card game a la Magic: The Gathering. 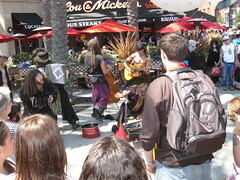 This entry was posted in Conventions, Strange World and tagged Comic Con, Comic Con 2010, San Diego, SDCC on August 2, 2010 by Kelson. I assumed the anti-CIA guy was legit — the way his placards were lettered, in varying sizes, not like something planned but a bit ad hoc and unplanned as the words tumbled forth. The thing is, if I’d seen him by himself, I would have assumed he was serious. But with all the alternate reality game/viral marketing promotions — especially with the guys dressed as MIBs — I just couldn’t be sure. There’s an interesting idea for a story: someone’s been messed with by the CIA, and starts complaining…and then real CIA agents pose as fake CIA agents for an ARG so that everyone is convinced he’s just part of the game! Well that does it, Kelson is now officially my favorite coverage of the ‘Con. I love that you’re actually reporting on the outside like it is it’s own event. 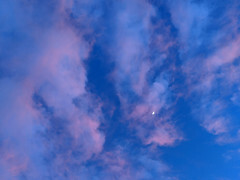 ….which it is. 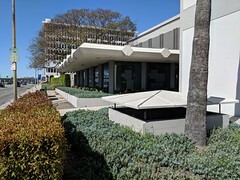 For the last 2 years I’ve noticed the “new ‘Con” isn’t even inside the building, it’s outside. People like me who had tickets actually preferred to avoid the crowds and stay outside. Everything you’ve said above it true, right down to the way we ALL wondered about that dude with the CIA sign. Viral or not? Who the hell can tell in all that? ( LOL, “Stay classy San Diego.” ) Good one. You got some really cool pics of all the happenings outside of Con ( and me and my Ecto – you’re one of few people that took pics who actually POSTED them – thank you ) as well as a mix of inside. Better than most online news agencies. Thanks again. I live vicariously through your report.